By PolitiFact Staff on Thursday, March 21st, 2019 at 12:07 p.m.
PolitiFact will partner with Noticias Telemundo to offer fact-checking in Spanish ahead of the 2020 presidential election. PolitiFact is a fact-checking website owned by the Poynter Institute for Media Studies. Noticias Telemundo is a leading news provider for 58 million Hispanic people in the United States. PolitiFact reporters and editors will be made available to Telemundo for on-air interviews, and Noticias Telemundo will be able to send statements for PolitiFact to fact-check for Spanish-language audiences. 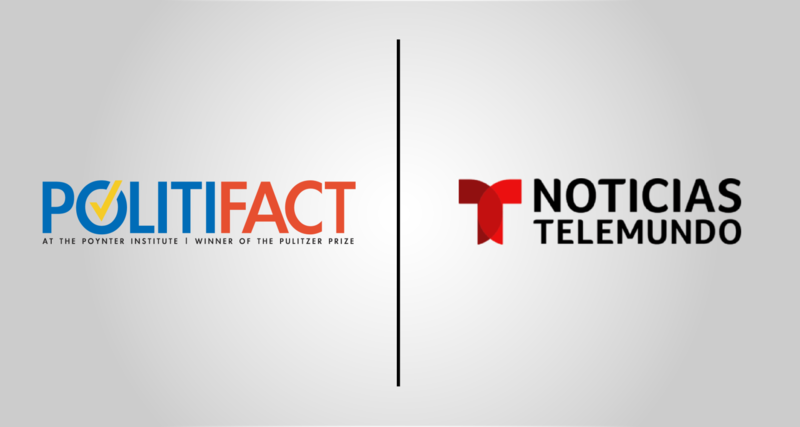 The two organizations also will collaborate to translate PolitiFact fact-checks into Spanish for use both online and on TV, including Noticias Telemundo and the broader NBCUniversal Telemundo Enterprises. "When politicians are making statements about critical issues like health care, education, immigration and the economy, especially ahead of major elections, the voting public needs a trusted place they can go to find the truth," said Neil Brown, president of the Poynter Institute, which acquired the nonprofit PolitiFact in 2018. "For millions of Spanish-language news consumers, that place is Telemundo. Our collaboration means that a huge contingent of the U.S. population can now determine the accuracy of information in their native language." PolitiFact is the largest political fact-checking news organization in the United States and won the Pulitzer Prize in 2009. National PolitiFact reporters are based in St. Petersburg and Washington D.C., while news partnerships expand PolitiFact reporting into 13 states, including those with more than one million Hispanic residents like California, Texas, New York, Florida and Illinois. "Hispanic issues are at the center of the political conversation, which is becoming increasingly polarized," said Luis Fernández, executive vice president of Noticias Telemundo. "Offering PolitiFact’s unique form of accountability journalism to our audience helps strengthen political discourse by centering it on the facts and adding context for the decisions people make every day. The stakes are incredibly high going into the next electoral cycle and we want to make sure our audience has the right information." Noticias Telemundo’s award-winning television news broadcasts include the daily newscast "Noticias Telemundo" with José Díaz Balart, among others. In addition, Noticias Telemundo produces award-winning news specials, documentaries, investigative reports and news events such as political debates, forums and town halls. "PolitiFact’s independent reporting and analysis both provide explanations for voters and hold political candidates accountable," said Angie Drobnic Holan, PolitiFact editor. "Because the Hispanic electorate is a critical target for politicians campaigning in 2020 — and therefore a target for political misinformation and spin — PolitiFact wants to reach this audience as well. With Telemundo as a partner, PolitiFact will be a go-to source for authoritative, vetted information Hispanic voters can trust during the election and beyond." See interviews with project leaders.